- The full path of the folder. Clicking on it switches to the Folders view with this folder selected in the folder tree. - The number of passwords that this folder is currently protected with. - For each folder password, clicking on the number opens a window that you can use to change the text of this password or delete it. Clicking on the short description of the password opens a window that you can use to change the password properties. - If the number of passwords for this folder is less than the limit (4), a link appears that lets you add another password to the same folder, with a different text and properties. 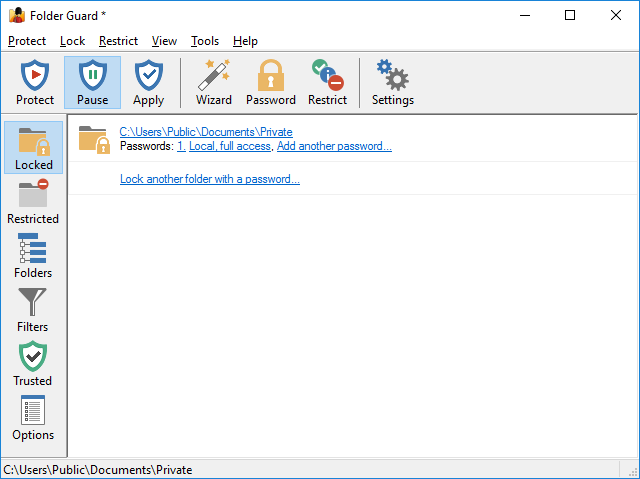 You can also right-click on the items in the list and use the commands on the context menu that are applicable to the password-protected folders. The last item of the list offers a link to start the Wizard that you can use to protect another folder with a password. If several different folders are password-protected, they are listed alphabetically according to their paths.